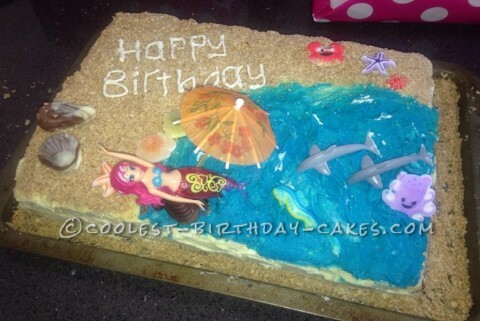 I made this mermaid beach cake for a 6th birthday celebration. I started by making the cake. I doubled this recipe because I was using a 9×13 width (inches) and 3 inch length square cake tin. I added all of the dry ingredients, such as the flour, baking soda, baking powder, salt and sugar. I mixed these until combined. I added the milk, vegetable oil, eggs and vanilla extract together until well combined, and then I added the boiling water gradually. Afterwards it was beaten on high speed to add air to the batter for about one minute, though if beaten too long could result in large bubbles in the cake. Since I have a particularly strong oven I do not preheat. If I were to preheat my food would burn a lot quicker. I quadrupled this icing recipe for the cake, though I had a little left over. For the icing I got the butter and beat it on high until it was very light and fluffy. Be careful here because if you were to over beat the butter and milk would separate and create buttermilk. Afterwards, add half of the icing sugar and half of the milk. As soon as the icing sugar is combined beat on high for about 10 seconds. Repeat with other half, this time adding the vanilla as well. If icing is not desired consistency leave to refrigerate for 15 minutes or add more milk. Vanilla wafers (about a whole box) Or graham crackers. Any small mermaids at your local store (1 used). Multiple sugar decorations (we bought these from our local cooking shop, but you can get most of them online. To flatten the cake, I cut along where the cake had domed. I frosted the first cake using the uncolored icing, and then cut the second cake and put it on top of the first. Next, I cut the chosen corner down diagonally, moving very slowly and not cutting into the lower layer. Then I iced the sides with uncolored icing, first piping it with a big and long nozzle and then using a spatula to spread it out. My icing was a little stiff so I sat the spatula in hot water every now and then to help the icing spread without the crumbs coming up. I let that sit for about 30 minutes to an hour in the fridge, which will help the crumbs to not come up when putting on the second (and final) layer. While that set I made the sand, combining the ingredients and crushing with a mortar and pestle. I then left to refrigerate for however long necessary. To make this cake you need a lot of time and patience, and I believe that was the most difficult part. I chose to make this cake because the theme of the party was beach, and though it was for a 6 yr old girl I think this cake can be used for one of any age.